HGTV designer Lisa LaPorta has joined forces with kitchen and bathroom faucet manufacturer Pfister to share tips on how homeowners can achieve a desired look in their homes. LaPorta offers her expertise on four different styles via the company's website, FixtureForward.com. To achieve a classic elegant bathroom, LaPorta suggests a color palette that includes earth tones or rich hues like golds and reds. When choosing bathroom faucets, she suggests those with a bronze finish. "Bronze is a really great finish that feels aged and traditional but is somehow new," she said on FixtureForward.com. She also suggests carrying the metal finish throughout the room on door hardware, bathroom vanity hardware and light fixtures to reflect light and add richness. Those who prefer a more sleek, clean and modern look may prefer a crisp contemporary style that employs a monochromatic color scheme in shades of white, tan or grey and includes simple details on bathroom furniture and fixtures. 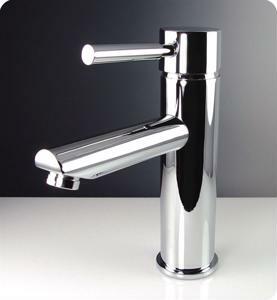 Installing bathroom faucets with a stainless steel finish and sleek design helps to add drama. Another modern look, which LaPorta calls modern metropolitan, also features clean lines but infuses pops of bold color and shimmer with bathroom furniture and fixtures. Individuals who want an antique, shabby chic or vintage décor style in their bathroom can achieve the look by layering multiple textures, styles and materials. An antique bathroom vanity paired with an old-fashioned looking faucet in a brushed nickel finish is ideal for this look.